Featuring all of the latest Reesor's Market & Bakery News and Recipes! Mid-December is a very quiet a time around the farm compared to any other time of the year. Sure, there are some things to do in the farm workshop and a few details to take care of at my farm desk, but with the last jobs in the field complete, it’s time for a change of pace. I am looking forward to doing those jobs in the shop and thinking and preparing for next season. It is remarkable though how quickly another farm season comes around because in about two and a half months it will be time to frost seed the wheat field with red clover seeds to follow the wheat crop. And every year many farmers tap their maple trees in February. But in the meantime I am looking forward to the Christmas season with my family and enjoying the slower pace that winter provides me as a farmer. Wishing everybody a wonderful holiday season! This easy and delicious winter soup has lovely seasonal flavours delicious for Christmas-time. Don’t worry about the long list of ingredients which is mostly aromatic herbs and spices that pay off with big flavour. If you don’t have every spice or if you want to use dried spices go ahead and make it to suit your taste. Strategic use of the microwave to cook the squash and sweet potato makes this soup come together very quickly. For extra flavour, peel and cut the squash and sweet potatoes into 1” chunks and roast them at 350 ° for about 1 hour. But using the microwave saves a lot of time and effort and the soup still tastes great. Slice the squash in half and scoop out the seeds. (Save the seeds to roast separately at 350 ° with your favourite spices such as cumin, chili powder, salt, pepper.) Scrub the potato and stick it several times with a fork, so it doesn’t explode in the microwave. Microwave the squash and sweet potato until soft. Let cool until able to handle them and then scoop out the flesh of each of the vegetables and set aside together in a bowl. Meanwhile, heat a large pot with the oil over med-high heat. Add onion and sauté until tender, about 5 minutes. Reduce heat to medium and add the sweet red pepper, garlic, and ginger and cook just until fragrant. Add the thyme, orange zest, curry powder, nutmeg, cinnamon stick, and bay leaves, mixing everything thoroughly. Add butter, brown sugar, salt and black pepper. Stir together until well mixed. Add the squash and sweet potato and stir well. Add the chicken stock, stirring to blend everything together. Bring mixture to a boil, then reduce heat, cover, and simmer for 30 minutes, stirring occasionally. Remove thyme sprigs and bay leaves. Allow the soup to cool a bit and carefully use a stick blender or a blender to puree until smooth. Add the cream and coconut milk if desired and stir. Reheat gently if necessary. Garnish with additional cream or coconut cream when serving. When you need a quick lunch please stop in to Reesor’s Market & Bakery and check which of our homemade soups are ready to go in our new soup urn. The $4.95 container might fill you up or you might want to add one of our sandwiches made daily in our deli, a wholesome salad or a coffee and muffin. Our selection of outdoor greenery urns, festive cut flower arrangements and poinsettias adds freshness to your front yard and indoors. Try a new colour scheme for your tree with unique ornaments and remember to pick up beeswax candles for your table or for hostess gifts. Please note we’ll be closing at 3 pm on Christmas Eve and New Year’s Eve. Here are some ways Reesor’s can help make your Christmas and seasonal celebrations taste great with our unique selection of savouries, meats, side dishes and sweets for all your celebrations. Having fun and raising money at the same time is a great combination! Thanks to everyone who ventured into our farm’s corn maze this year. You helped raise $2,148 for the Canadian Foodgrains Bank for international aid. Thanks also to Burkholder Farms who harvested the feed corn for free, so that an additional $650 was raised from the sale of the corn itself. You can easily fill your party and dinner tables at Reesor’s. For appetizers we have artisanal cheeses and deli meats and a new line of fruit compotes from Wildly Delicious that are the perfect accompaniment to cheese and crackers. For office or family pot-lucks we have “Party Sized” Signature Lasagne, Spinach Lasagne, and Macaroni & Cheese. Go traditional on Christmas eve with our classic Quebec tourtière, a blend of mildly spiced ground beef and pork. How will you decide what you’ll serve for dessert? Seasonal caramel apple pie, mincemeat pies or tarts, sticky toffee pudding, shortbread (gluten free shortbread too), fruitcake or our amazing homemade-style squares? We still have limited sizes of fresh, local turkeys available for you to order. These turkeys are raised by the Fedemma family at Round the Bend Farm. Or you can order a freshly smoked ham prepared by Jo & John Meats. Come visit us or call 905-640-2270 to see what is still available. Make your favourite bread stuffing using Reesor’s Pilgrim bread, mash up beautiful white Ontario potatoes, slice up sweet potatoes for a casserole, roast some Ontario squash, or make a fresh cabbage-slaw. Remember to pick up enough of our Ruby Red Cranberry Sauce for Christmas dinner and for turkey sandwiches on Boxing Day. 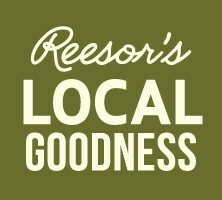 Welcome to the official source of recent news and recipes from Reesor's Market & Bakery!